Ahhh, Fall. My very favorite season. I’ve lived in Southern California for most of my life now so we, unfortunately, don’t get too much of an Autumn chill and I miss it so (I spent my childhood on the East Coast where there are actual seasons). Nonetheless, Fall remains one of my favorite seasons. The chill in the air (though today is supposed to be a toasty 85 degrees) and the start of my favorite holidays (um…hellloooo Thanksgiving!). For the past few years, our dear friends have hosted a Fall Breakfast at their place. Oddly enough, even if we are lucky enough to have a chilly weather streak, without fail it is always unseasonably warm the day of Fall Breakfast! This year, with our friends having moved into a beautiful new place, Fall Breakfast was a wonderful way to help break in the new place. Only thing is, our friends also have a brand new baby. Those of you who have been through new parenthood know that the last thing you want to do is to host a party and cook up a storm. The natural solution? Your friends do most of the cooking and you just sit back and enjoy. And that’s what we did. All the friends were responsible for a dish or two and breakfast came together quite nicely. It was also Olivia’s first Fall Breakfast with our friends and their baby girl’s first official Fall Breakfast. Quite momentous. For our dishes, we thought we would do one sweet dish and one savory dish. TJ and I figured that he’d make some pumpkin pancakes at their house the morning of. 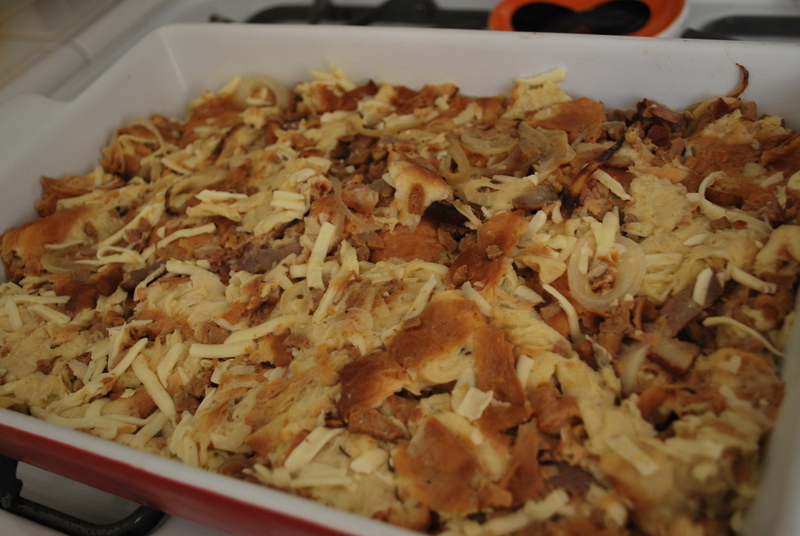 I decided the savory dish to complement that would be our Savory Breakfast Pudding. It’s a bread pudding – but savory. That description kind of throws people off a bit, but I promise you it is delicious. 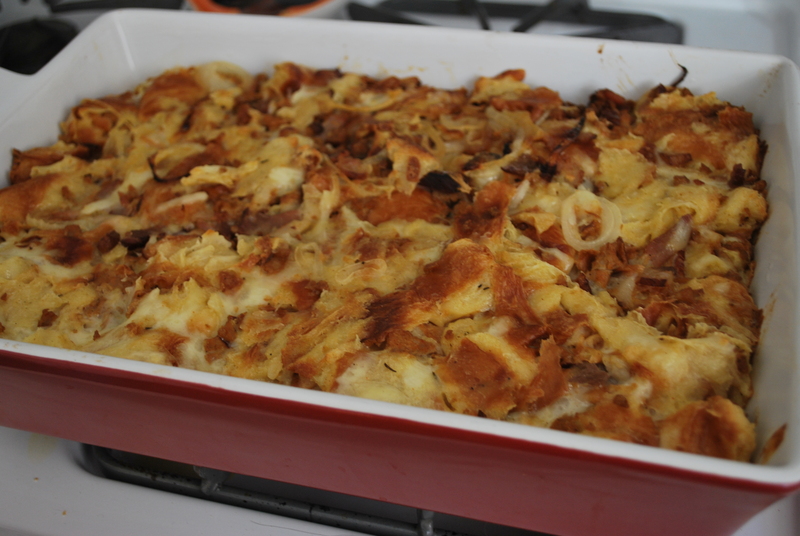 It is like a breakfast sandwich – in casserole form. I originally got this recipe from an Emeril Lagasse recipe. I’ve changed a few things about it to suit out tastes a bit more. Either way you go, I don’t think you’ll be disappointed! Preheat the oven to 350 degrees. Lightly grease a 9×13 baking dish. We just lightly greased our dish with butter. 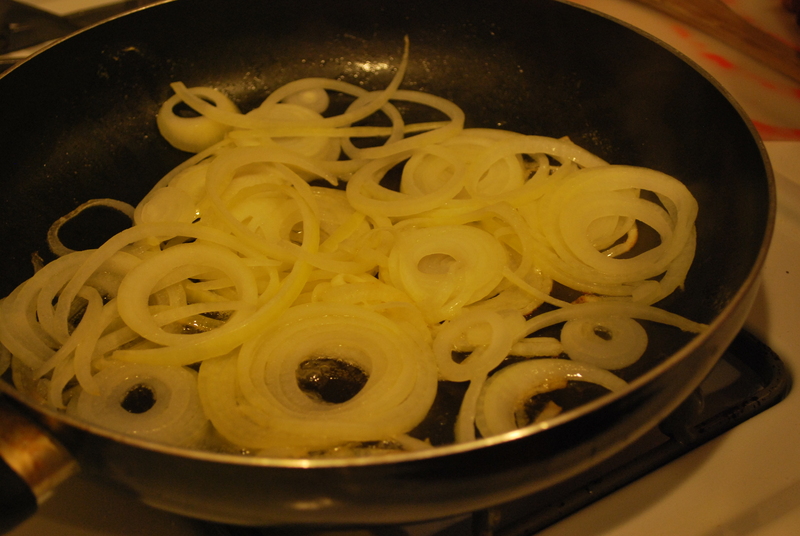 In a skillet, melt 1.5 tablespoons of butter and toss in your onions. Saute the onions until they are soft and starting to caramelize. Throw in your chopped up garlic and cook another few minutes. In another skillet, melt the remaining 1/2 tablespoon of butter. Add your bacon and cook for about 3 minutes. Remove the bacon and drain on a paper towel. In the same pan, cook up your crumbled sausage for about 3-5 minutes until browned. Remove the sausage and drain on a paper towel. Set aside. In a large mixing bowl, whisk the eggs up. 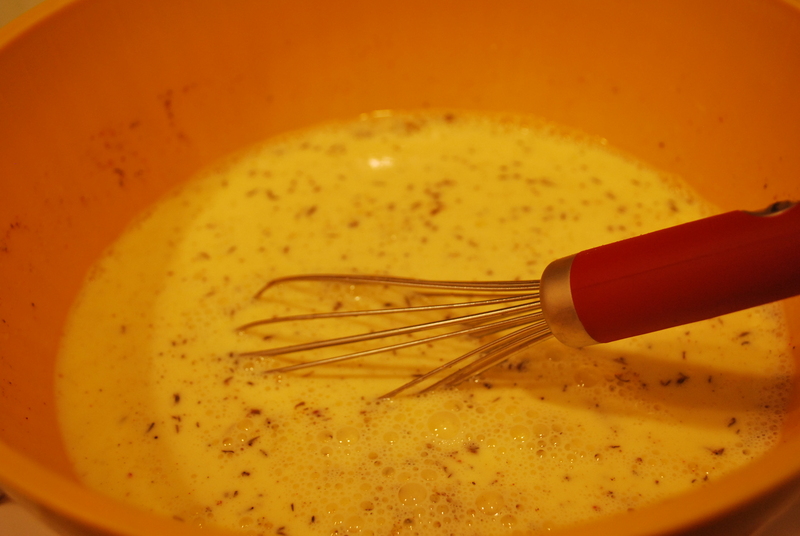 Whisk in the milk, cream, salt, pepper, and Essence. Once it is all mixed in, throw in your torn up croissant pieces. 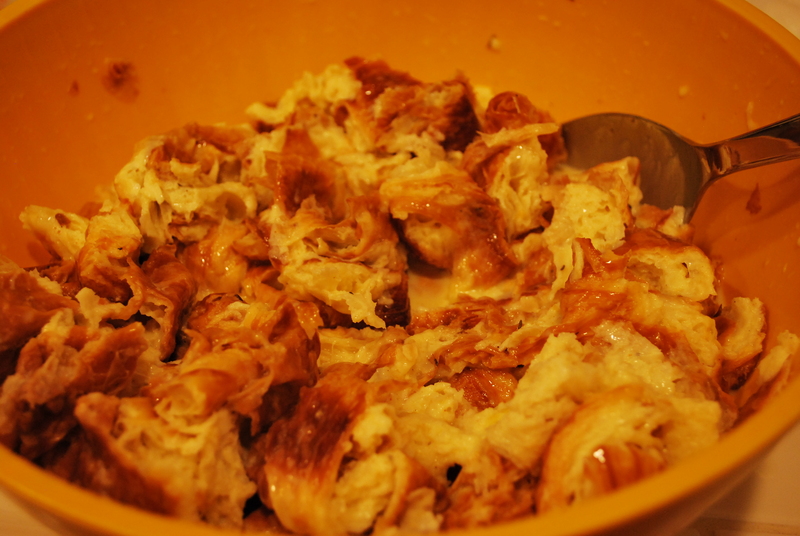 Make sure the croissant pieces are covered in the egg mixture. Let sit for 5 minutes. Now, throw in your sausage, bacon, onions, and 2 cups of grated Fontina or Gouda (we used Fontina here because..well, because that’s what Trader Joe’s had on hand that day!). Stir to combine and let sit for another 5-10 minutes. 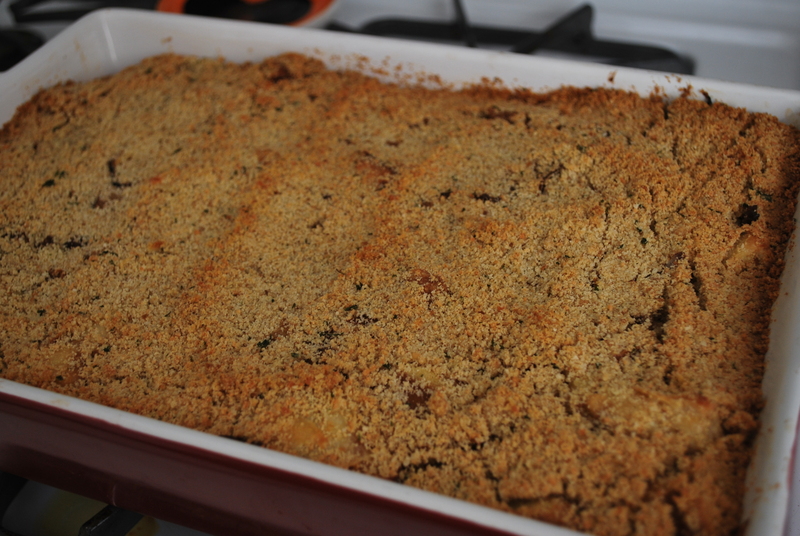 Pour the mixture into your lightly greased baking dish. Bake covered for 40-50 minutes, until almoat completely set. What we did is prepare the dish the night before the breakfast. You can assemble it up to this point (before you pop it in the oven). Cover it with foil and pop it in your fridge, unbaked, for 8 hours/overnight. The next morning, we simply started by uncovering the dish and baking it for the 40-50 minutes, as directed above. 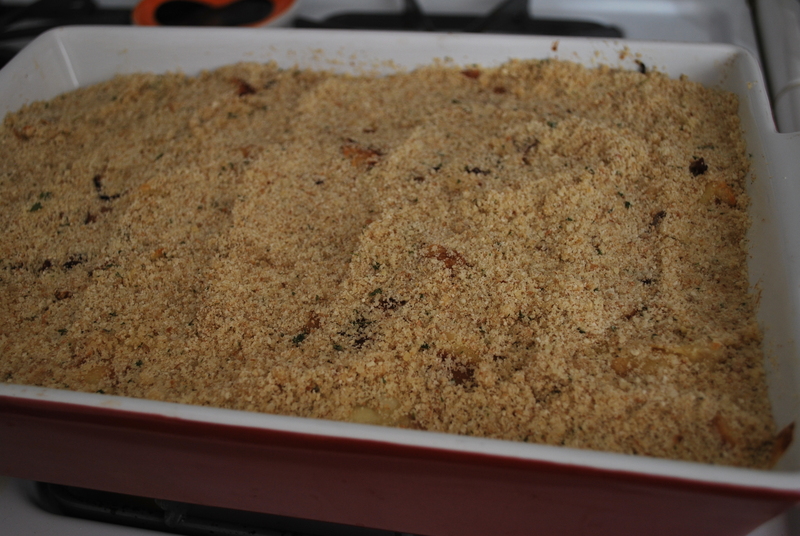 In a small bowl, combine the bread crumbs (feel free to use seasoned bread crumbs, etc. It is quite delicious), grated Parmesan cheese, and 2 tablespoons of melted butter. Uncover the pudding (if you’ve covered it with foil to prevent crazy browning) and spread the Parmesan bread crumbs evenly over the pudding. Increase your oven temperature to 375 and pop the pudding back into the oven for another 15-20 minutes (yup, pop it in while the oven is increasing in heat…no need to wait for it to fully get to 375). It is done when the top is nice and toasty and the rest of the pudding is set (just insert a knife and see if it comes out rather clean). Wait 15 minutes before eating. There you have it! This is best served hot. Play around with the type of sausage you’d want to put in. Hot sausages are great to use and gives this dish a nice kick. We have even used Kielbasa and just chopped it up super small. Whatever you’re in the mood for, try it out! 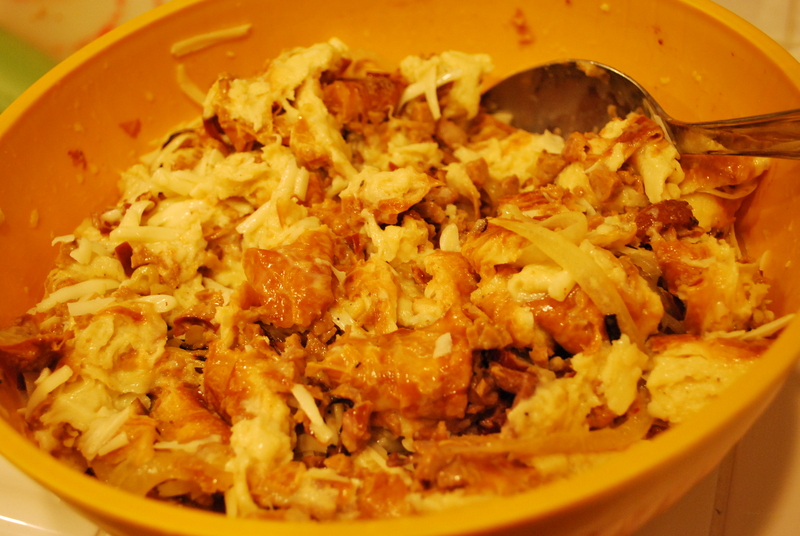 This is a great dish to bring over for a potluck, great for holiday breakfasts when the family is all gathered around. It is so easy and you can just let it soak up all the great flavors overnight. Next morning, pop it in the oven and there you have it – a great breakfast ready for the family (or friends, of course!) that Tastes Oh-So-Good. This is a great combo of seasonings to have on hand and you can find his recipe here. I have also listed out the ingredients below for your convenience (I’m so nice, right?!). MIx it up. And, in the words of Emeril – “BAM”! You’ve got yourself some Essence.